Carol has been a friend of the Atrium ever since we piloted our violin program here in 2009. Her company rents us high quality, fully insured instruments at a reasonable rate. [On a side note, Carol’s personal commitment to excellent string education for all kids has resulted in the “Johnson String Project”, whose mission is to rent instruments at low rates to El Sistema-inspired programs with the goal of eventually donating instruments to kids who need them]. At any rate, some time ago I consulted with Carol about an idea I had to connect the Atrium violin program with service learning. Carol unhesitatingly recommended that I contact Music for Food (MFF). After meeting with MFF’s executive director and then their artistic director, the great violist, Kim Kashkashian, we found that Atrium and MFF were a natural fit. Since then, MFF has sent two resident quartets to give wonderful assembly-length concerts at our school. During these performances, the musicians have talked to our students about their efforts to raise awareness about hunger and have shown us all the way in which music can help feed the hungry. 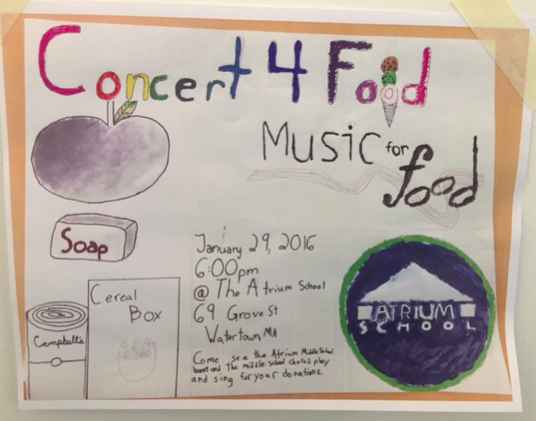 Music and Service Learning: Inspired by MFF, we have decided to put on a fundraising concert of our own at Atrium. Bob Dowling, a middle school teacher at Atrium, forged a partnership with the St. Patrick-St. Vincent de Paul food pantry in Watertown. 100% of the proceeds of the concert, including all donations of non-perishables and toiletries will go directly to the food pantry. Needless to say, this is a first for us: the concert represents not only a wonderful component of Service Learning, but it is also a terrific opportunity for our middle schoolers to employ their musical skills to make positive change in the world. On a personal note, I am particularly thrilled that the concert will take place this year, just a few months before our first grade 8 class--our very first batch of Atrium violinists--graduates. 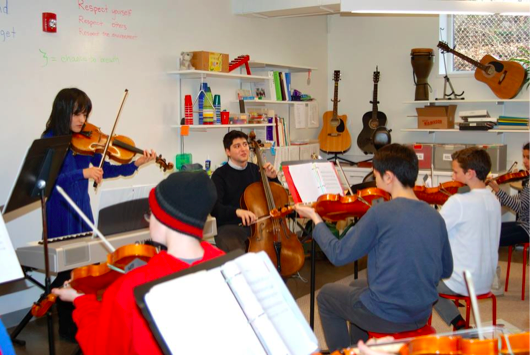 People, Get Ready: On Tuesday, January 12th, we were thrilled to welcome the Omer Quartet back to school, this time to coach our middle school violinists as they prepare for the upcoming fundraiser. I really liked when Omer group came and taught us. They taught me some useful things, and perfected the ones I already knew. For example, my Lion Hold was not great, but they showed me how it should be done and now I'm a lot better at Lion Hold. They gave me advice [to help] me purify my notes, so their beauty would be un-tarnished. I would like to thank them and ask them to teach again sometime. I appreciated their willingness to help and to teach. Their tips and new ways to work together as an ensemble will help us at Atrium and beyond. Breathing together and singing together to help us keep in time are two very useful things. First I learned an easier way to practice a single part of a song and pay more attention to the rhythm with my vocal rather than singing the notes and trying to match the rhythm with my voice. Second I learned that even at where they are in their musical careers, they still need a teacher. Another thing I learned from them was how to be persistent at the violin. I saw them as 5 people who succeeded as musicians, and it inspired me to want to never quit because the piece I was learning was hard, and to keep trying. The Full Line-Up: The concert will feature not only middle school violins, but also our Middle School Chorus and the rockin’ Atrium Band! Absolutely every middle schooler will perform in the concert, which will last roughly an hour and fifteen minutes (there will be no intermission). The program will offer plenty of musical variety and some audience involvement, so it will be appropriate for listeners of all ages. Get ready to hear some songs you’ve never heard us play, as well as some recent Atrium favorites! What You Can Do: Please encourage your friends and family to attend our Music for Food concert on Friday, January 29th at 6:00. We are recommending an entrance fee of $10, but it will be “pay as you can”. Some patrons may prefer to donate unopened packaged food and toiletries, which will be hugely welcome. One More Thing: Our seventh graders are working on flyers (see below) and other forms of advertising, and Atrium will be sure to share these so anyone can post them on their favorite social media outlet, or display hardcopy flyers at local businesses and community centers. Thanks so much. We look forward to a tremendous event!